I attended the panel at New York Comic Con that unveiled the new Bionicle line that had been announced a week earlier on the internet. They began by letting us know that they appreciated the fans that kept the interest alive for the past five years, but the storyline that lasted for about a decade was over and this would be a reboot with an all new story for the modern kids. The designers started by looking at the designs of the prior iterations of the Bionicle characters and used them as a jumping off point to create newer versions that are “more contemporary and edgy.” Even the parts that make up the characters use some of the original parts while introducing approximately 30 new building elements to create the characters with. Even the characters’ mechanisms are based on the old figures, with their “battle functions” allowing for movements like swinging arms and masks popping off, giving them playability similar to the 2000’s Bionicles. At launch there will be 6 Bionicle Toas (aka heroes) based on the old figures along with smaller figures called Protectors that can interchange parts and weapons with the Toas. 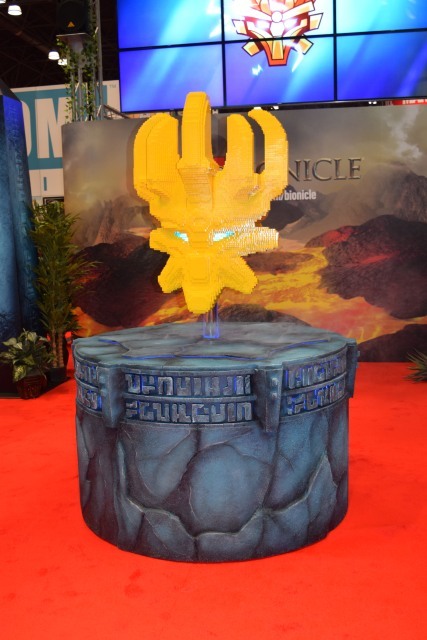 The Bionicle toys will be available starting January 1, 2015 and will be led up to with a series of animated shorts online.